Henry the Juggler is believed to be in your area! The Music Alley presents his hilarious show on Thursday, August 18, at 5 PM, with generous funding from the Bridgewater Cultural Council. Henry the Juggler is considered armed (and legged) and dangerous. He is known to cause spontaneous outbursts of laughter. He speaks little, but says a great deal through his expression and body language (and road signs!). He has in his possession BALLS, CLUBS, RINGS, TORCHES and other apparatus of his trade. He is capable of changing his height through the use of stilts, and walking on a thin wire high above the ground. WARNING: Henry involves innocent bystanders in his act. Henry the Juggler is a professional. He has been performing for over thirty year and has brought laughter to tens of thousands of people up and down the East Coast - at theaters, libraries, schools and festivals. He studied physical comedy at California's Dell'Arte School. He is an active member of the International Jugglers' Association. Music Alley and the Bridgewater Cultural Council are believed to be in cahoots with Henry. They have sponsored his appearance. For more information, please look up www.HenryLappen.com, or contact Marilee Kenney Hunt at 508-659-1220 or mkhunt@bridgewaterma.org. 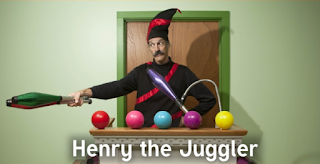 Don't miss Henry the Juggler!